Melon. In a smoothie. It wasn't something I had considered before. But I wised up: How can I deny myself something so energizing and refreshing as a smoothie fragrant with honeydew, cantaloupe, or watermelon? Here's what makes melon smoothies so good for you, plus top-rated recipes for you to try. What's so Great About Melon Smoothies? Like any fruit-based concoction, your melon smoothie will only be as tasty as the melon you've selected. Here's what to look for when choosing melons. Look at the vine end of the melon, it should be hard and slightly sunken. For honeydew melons, you can often tell ripeness by giving it a shake: you can actually feel the seeds moving inside it if it's ripe. The rind of a ripe cantaloupe should be orangeish not green, and the melon should smell like a cantaloupe. A ripe watermelon should feel heavy and full for its size. Before cutting your melon, wash it with soap and cool water to remove any bacteria. Slicing into a melon that has bacteria on the rind can introduce pathogens into the fruit. Use a long sharp knife to cut the melon in half, right through the center of the melon. Use a broad, shallow metal spoon to carve out the seeds, fibers, and soft spots. If you have selected a dud, add a bit more sugar or honey to sweeten the fruit. If your melon separates from the rest of your smoothie, reunite the ingredients by blending with a splash of half-and-half or coconut milk. VIDEO: Check out this video to see a great technique for cutting a melon into chunks that are perfect for melon smoothies. These are some of our favorite melon smoothies. And for more healthy breakfast ideas, check out how to make healthy smoothies. Rave Review:"What a wonderful light, refreshing and yummy drink," says Isabela14. "Had it with a slice of toast for breakfast and it absolutely made my day." Rave Review: "Good stuff," says iheartnitz. 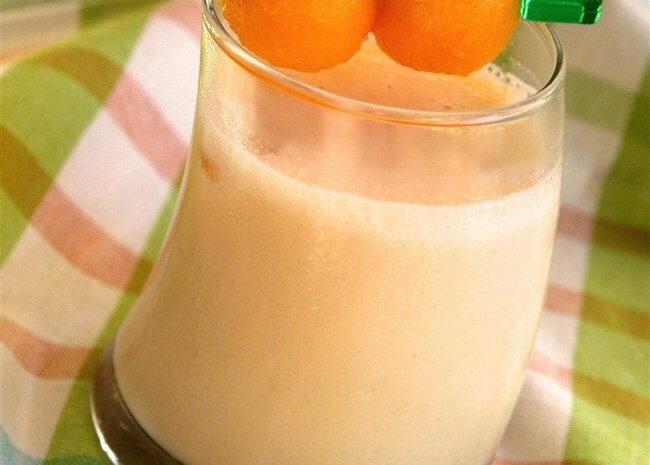 "I used bottled lime juice and frozen melon balls. As a result, my smoothie was slushy and thick. Yum." Rave Review: "I just made it for a light dessert," says CYBERSTU. "Light, refreshing, and really nourishing as well. This would make a great treat for brunch." Rave Review: "WOW! This was much different than the usual fruit-sweet and hearty green drinks," says Sam Nemati. "It had a more delicate, bizarre touch to the flavors that I REALLY LIKED." Rave Review: "Used vanilla Greek yogurt (which I had on hand), added a few more ice cubes, and ended up with a really creamy breakfast smoothie," says lutzflcat. Check out our complete collection of Smoothie Recipes.